This is a delightfully furnished luxury 3 bedroom villa, sleeping 6 people, sited on the highest point of the resort offering breath taking views. The resort complex also as to offer its own restaurant/bar. With one of the largest supermarket on the island is less than 5 minutes walking distance. Its only a short stroll from resort amenities which includes the popular outdoor market, the 150,000 sqm Water Park and a host of other activities all within 30 minutes walking distance. With south facing rear garden, which captures sunshine from morning to night, complete with your own private heated swimming pool and patio area, with stunning sea and mountain views from garden and roof terrace. Also Includes free of charge, WiFi and Satellite TV which includes BBC 1, BBC 2, ITV 1, Channel 4, Channel 5, Film 4, RTE 1, also DVD and CD player. Pool Heating is recommended in winter months - October to April. Digital safe deposit box, portable cooling fans, child's cot & high chair all included in the weekly rental price at no extra cost. En-suite bathroom to bedroom 1 with bath, shower, wash basin, wc and bidet. Bedrooms 1 and 2 with shared bathroom c/w shower, wash basin and wc. Downstairs wc with wash basin. The lounge dining room is stylishly furnished with leather sofas, coffee table and 6 seater dining table and chairs. Free WIFI also UK television which includes BBC 1, BBC 2, ITV 1, Channel 4, Channel 5, Film 4, RTE 1, also DVD and CD player. Separate kitchen with oven/hob and extractor, microwave, fridge/freezer, kettle, toaster, coffee maker and all essential utensils. Pool heating optional extra (Pool heated to approximately 26°C to 28°C) charged at £7 per day (£49 per week) Pool heating is recommended in winter months - October to April. Notes on accommodation: South facing rear garden, which captures sunshine from morning to night, complete with your own private heated swimming pool and patio area, with stunning sea and mountain views from garden and roof terrace. Outside: For your relaxation a full range of garden furniture is provided which includes sun loungers, table, chairs and a BBQ. The heated pool measures 6m x 3m and has a combination of tiles around the pool area and surrounded with artificial grass. A pergola offers shade on the rear of the garden and the front garden is planted. Also a large roof terrace with all day sun. Utility Room: Washing machine, ironing board and clothes airier. Cleaning / Towels / Linen / Maid service: Bedding and bed spreads are supplied, also bath and hand towels. The property is cleaned prior to arrival, the bed linen and towels are changed on a weekly basis. Other: Large roof terrace with outstanding views to watch the sunset over the mountains. Great stay. Comfortable and spacious villa, adequately equipped for a family holiday. Loved the pool - well worth the cost of having it heated. We only left the villa to get supplies from the local supermarket - 10 minute walk, well stocked and great value. The villa was as described, very safe area. The rooms were nice and there was everything we needed. The only thing was that villa was a bit far to walk to corralejo centre and the beach, around 40min walk, by car only 5-10min, but taxis are very cheap, around 4 euros to take you there and reception staff was very helpful and can call the taxi for you. Overall we enjoyed our stay very much. Unable to fault this villa. although taxis are readily available to get you into the centre and back again. The villa is in very good condition and very clean. There is enough cooking equipment in the kitchen for those who choose to cook for themselves and everything worked as it should have, including the bathroom equipment. My wife was particularly impressed with the fact that all bathrooms had soap dispensers at the sinks. We chose to have the pool heated as it was early March and this proved to be ideal. As the owner Steve had contacted me to see if every thing was okay I pointed out that the safe had been left locked by the previous occupiers and he contacted the agent who came round to sort it out promptly the following day. Whilst on the phone Steve was very helpful providing useful imformation about the tv, the complex and where to eat etc. We wouid highly recommend this villa for a perfect holiday and hope to return in the future. Fantastic villa, Furteventuras best kept secret! Can not recommend this villa highly enough! Pound for pound you will not find any better villa in Fuerteventura. Have just returned from a fabulous winter break there and already wish we were back. Steve, the villa owner, went out of his way to ensure our holiday ran smoothly from start to finish, and was on hand to answer any questions we had instantly! 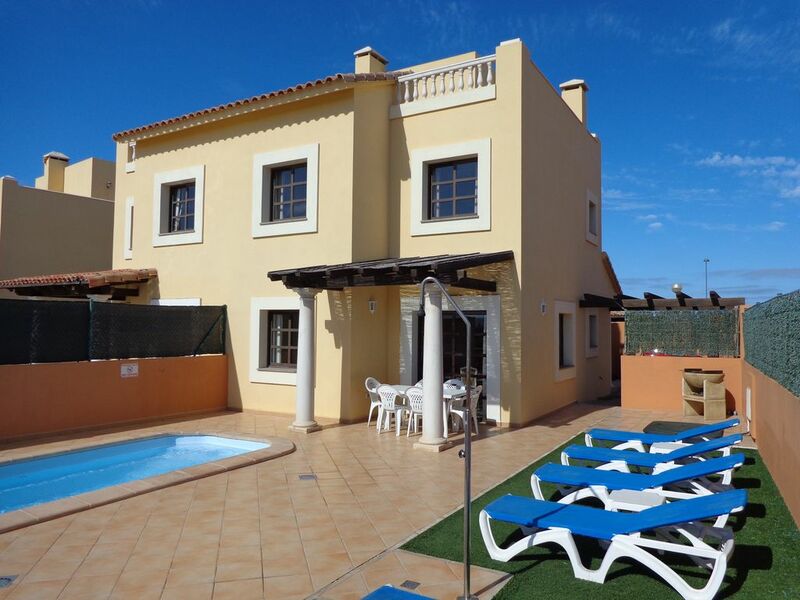 The villa itself is on a secure gated and well maintained complex around 5 mins drive from Corralejo’s main centre. Taxis are very easy and reliable, will pick you up direct from the villa front door and are less than 5 euros each way! Plenty of hot water when needed, and the bathrooms/showers were very good. The outdoor area and pool is great, fabulous views and captures the sun all day. We had the pool heated for our stay and it was lovely and warm even in January for when we fancied a dip to cool off. The supermarket (5 mins walk away) is fantastic, with so much choice and unbelievably cheap! You will not be disappointed if you shop there! All in all, a great villa. You will absolutely not get a better value holiday than this. We will definitely be returning. Thanks Steve for a great stay. Mark and Rachel, thank you for your kind words. I try to deliver top quality accommodation at realistic Villa rental prices. we really enjoyed our stay at the villa. very well kept villa & garden area with pool. everything you need is inside & outside the villa. free bus into town & only 5 euro taxi back. Thanks Pete, glad you enjoyed your stay. Corralejo town beach is the closest with its many restaurants and bars, approximately 35 min walk. For the more adventurous, Flag Beach with its beautiful white sand, spectacular sand dunes and clear crystal waters is a must, the beach stretches for approximately 11km and is very quiet (almost deserted in places). The distance from the airport is approximately 36km (35 mins drive approx). Car hire is recommended for this villa, we also recommend a local airport transfer service at a very reasonable rate should you prefer not to hire a car. Corralejo harbour area, with its large supermarkets and an extensive selection of bars, restaurants and high street shops is a 30 min walk (approx). The top section of the resort with bars, supermarkets, restaurants and the Water Park is only 20 minutes walk. Taxis are in plentiful supply at cost of approximately 5 euros from Corralejo harbour. Guests are also supplied with on resort 24 hour emergency contact number. Pool heating optional extra (Pool heated to approximately 26°C to 28°C) charged at £7 per day (£49 per week) Pool heating is recommended in winter months - October to April. Free WIFI connection available.